After weeks of heavy outflows, the tide has turned in emerging markets. Despite ongoing concerns about the Russia-Ukraine standoff and a Chinese slowdown, investors are dabbling in emerging markets once again. 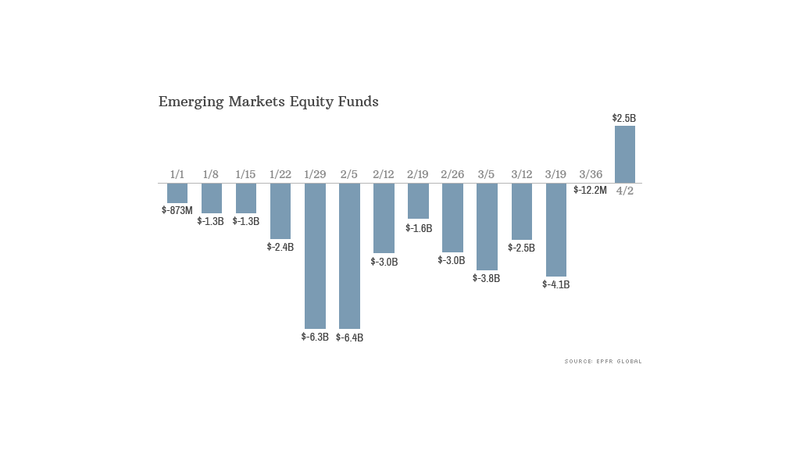 Nearly $2.5 billion flowed into mutual funds and exchange-traded funds that invest in emerging market stocks during the week that ended April 2, according to data from EPFR Global. It was the first time money poured into those funds since October. The inflow suggests that investors have regained some appetite for emerging market stocks, which were trading at a sharp discount following a big sell-off in January. The iShares MSCI Emerging Market ETF (EEM), which tracks the widely-followed benchmark for emerging market stocks, is now in positive territory for the year. Investors fled emerging markets in January amid fears about the so-called "Fragile Five" -- Turkey, Brazil, India, Indonesia and South Africa. Central banks in those countries were forced to prop up shaky currencies after political and economic concerns sparked big outflows of capital. According to Allan Conway, head of emerging market equities at U.K.-based asset manager Schroders, investors overreacted and stocks in many countries are actually trading at very attractive levels. While he expects most emerging markets to remain volatile in the short run, Conway said some specific countries could see "an avalanche of cheap investment opportunities by the end of the year." Specifically, he pointed to what he dubbed the "Fab Four" of Taiwan, Korea, China and Russia (assuming the confrontation with Ukraine does not escalate). Related: Time to invest in Russia? While investments in any country carry a certain degree of political risk, it is especially acute in many emerging economies since governments in these nations often own a stake in the largest companies in the country. Investors hope that upcoming elections in India, Indonesia and Brazil will set the stage for reforms that will make those economies more efficient, said Michelle Gibley, director of international research at Charles Schwab. She said there's also been talk of new stimulus efforts in China, the world's second-largest economy. Still, the optimism may be "misplaced" since there's no guarantee the newly elected politicians will follow through on proposed reforms, she added. "I'm still cautious on emerging markets," said Gibley. "They still have a long way to go to fix their structural problems." Emerging markets are generally considered more of a gamble than developed ones because the political risks are higher and many developing economies are exposed to volatility in commodities prices. On the other hand, economic growth has historically been stronger in emerging markets, many of which have benefited from an expanding middle class. That growth story began to unravel last year when the Federal Reserve first signaled that it would begin slowing its monthly bond purchases. The U.S. central bank has pumped billions of dollars into the global economy over the past few years and much of the liquidity has made its way into emerging markets. The fear is that developing economies might be left high and dry as the Fed gradually turns off the taps this year. Paul Christopher, chief international strategist at Wells Fargo Advisors, said it will take years for emerging market economies to work through excessive levels of domestic debt. "The Fed's policies have exposed some of the weakness in emerging markets," he said. "Those problems have been there for years, but as the tide goes out, you begin to see the hazards below the surface." While he has a positive long-term view on developing economies, Christopher said the average investor should not have more than 5% to 7% of a portfolio in emerging markets.